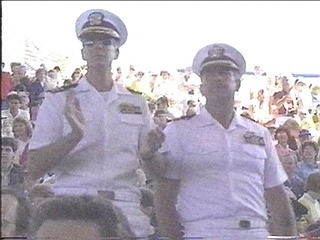 America's National Day at Expo 86 was scheduled to coincide with Independence Day celebrations across the United States. And with many Americans taking advantage of the long weekend to cross the border to visit the fair there were lots of Americans on hand to make the 4th of July one of the busiest days at Expo 86. 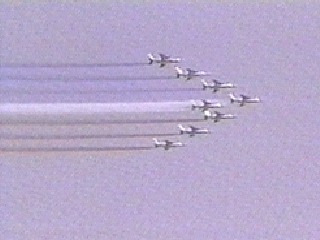 From 10:00 until Noon entertainment at the Plaza of Nations included performances by the U.S. Air Force Band of the Pacific Northwest, while overhead, jet fighters carpeted the sky with a stream of red, white and blue. 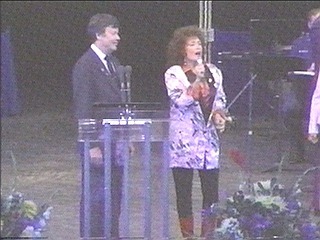 Loretta Lynn, who also did two shows at the Expo Theatre with the Gatlin Brothers that day, greeted the crowds and sang the American National Anthem. The official ceremony was followed with a movie screen sized video transmission from New York's harbour as president Ronald Reagan unveiled the newly renovated Statue of Liberty. 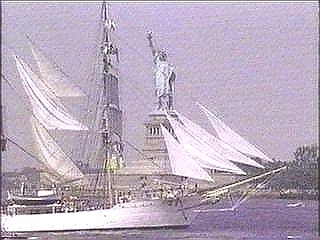 Side note: Tall ships from around the U.S.A were scheduled to appear at the Expo 86 "Parade of Tall Ships" to open a specialized period of ocean vessels. But many captains cancelled when they were asked to be in NYC harbour for Independence Day. The decision to cancel ruffled a few feathers.